Bathroom towel bars are often secured only to the drywall and not the studs. Over time pressure on the towel bar can cause it to work loose. Watch this video to find out how to repair this problem. Adding a hanging cabinet over the toilet is a great way to increase the storage space in your bathroom The cabinet can be made from medium density fiberboard (MDF) and used to store towels or toiletry items. Watch this video to find out more. A built-in medicine cabinet is a great addition to any bathroom. Since they are designed to fit between the existing studs in your wall, installation is easy. Simply use a stud finder to locate the studs, cut a hole in the drywall to fit the cabinet, and mount the cabinet to the studs with screws. Watch this video to find out more. In a cramped bathroom, finding a place for a wastebasket can be a real challenge. One way to solve this problem is by mounting it on the inside of a cabinet door. This not only provides easy access, but hides the basket from view. 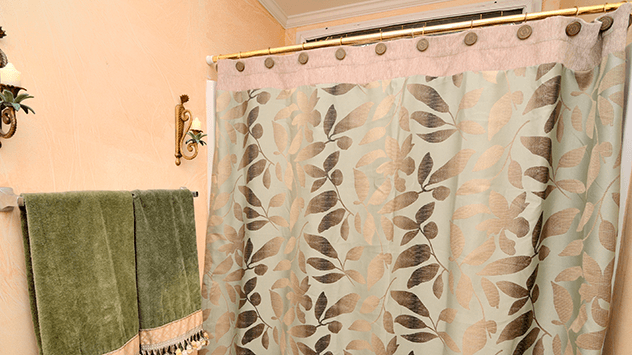 Find out how to repair a spring tension shower curtain rod to hold it in place. Watch this video to find out more.